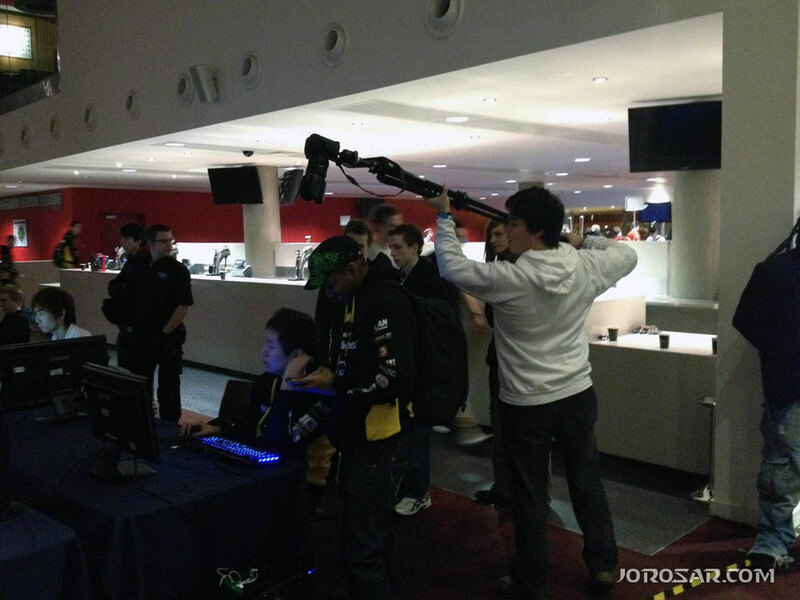 The Sunday was going to be a challenge for EGL4′s Starcraft II organisers. I mentioned in my previous post that ‘technical issues’ delayed play on the Saturday but not quite to what extent. In order to better understand some of the difficulties faced by the admin team and organisers, I’d like to start by outlining the challenge faced by the EGL4. On the Friday evening, sixteen computers were ordered in by EGL. Given the strict times where people had to leave the hall, there was a very limited amount of time to set up. This would not have been a problem had all the equipment been there but for some reason only eight of the sixteen computers were delivered to the SC2 tournament hall. These computers were set up anyway for a 36-player tournament on the Saturday morning, and were in-place just before the team had to leave the venue. On the Saturday morning, another problem quickly materialised. These computers were previously used in a “speed-building” event at the previous week’s LIT, the London International Technology show. Contestants would race to assemble the PC from basic parts and the fastest were the ones that won prizes. This in itself is not a problem as none of the parts were physically broken from abuse – however, it transpired that the computers did not get re-tested before being sent to EGL. Therefore, of the sixteen actually delivered, only eight would boot up – down to 50% capacity before the event ever started. In addition, several minutes into the games from Group A and Group B it was quickly discovered that sound was not working on four out of the eight PCs left, so down to 25%. Finally, two more computers throughout the day died completely and I believe were completely stripped and reformatted. This means at one point there were only two computers available for use and of course this was unacceptable. Quite a bit down from the original sixteen, I’m sure you’ll agree. Insert hero decision number one from the staff, who made the brave move of dismantling the stream and disappointing the viewers worldwide in favour of getting more computers to the players to run the tournament. 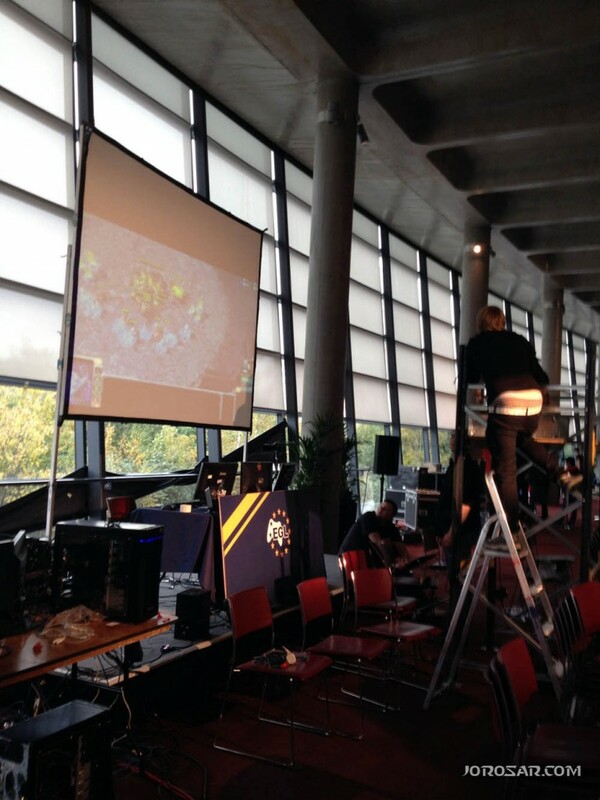 The four computers on-stage meant for the casters and observers were brought down so that more games could be played while the other computers could be fixed. Near the end of day one, despite the fact that we should have had 36 (including the casting lot) computers running for the entire day, we had 10 working for the end of the day (and at one point in the morning we were down to 2). There was even a point in time where the possible decision to cancel the tournament was considered. Thankfully, the organisers pulled through thanks to the quick thinking to stop the stream to use the extra computers, and all but four group games were finished on the Saturday by 22.00. 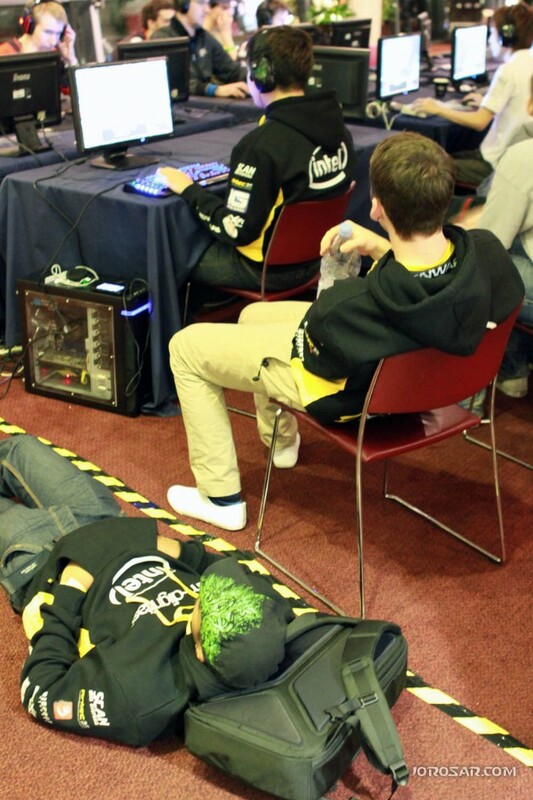 One of the organisers was forced to crash at his hotel early (18.00, when all the group stages were originally supposed to conclude) once double-digit PCs were working as he was on two days without sleep and exhausted because the problems that EGL faced were frankly completely unexpected and ridiculous, which is entirely understandable. As for what went on Saturday (all the good stuff) in the mean time, check out my previous blog post. Going into Day 2, the tournament was going strong as all the remaining computers had their problems fixed. The main issue now was that the entire tournament was still behind schedule because of yesterday’s issues, even taking into account the six hour ‘buffer’ of games finishing at 22.00 instead of 18.00 (that’s how big the delay was; not too surprising considering we had a quarter of the computers we wanted for a lot of the day). In light of the lack of PCs I offered the previous evening to lug in my old desktop computer (for those who have seen my Equipment Locker page, I’m referring to the original C.H.L.O.E., who recently got replaced and was sitting idle in my room waiting to be sold / passed on) and was told by text at squeaky-o’clock-in-the-morning on the Sunday that it could be used as the second caster’s observing computer. I duly brought the computer in and we were thereby able to use all 10 PCs that we had the previous day as well as a new PC for casting up on stage – with C.H.L.O.E. as the backup for observing. As many followers know, the stream was up on the Sunday and things, while behind schedule, went very smoothly indeed. 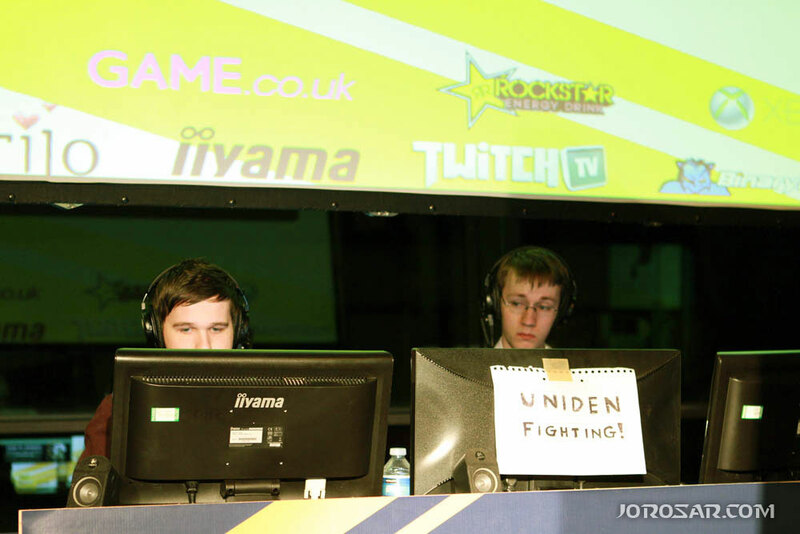 A massive shoutout is required here to Robin Lomax Bjerke, who I met at EGL4. He is a fellow London Barcrafter and is also an audio engineer who happened to have the correct equipment to record fantastic quality audio for the interviews! It is thanks to him that you will hear actual voices in the video as opposed to background noise and random cheering. I was also privileged enough to get up into the balcony overlooking the main stage, in time to watch the closing stages of the Halo: Reach tournament where Dignitas would take the final in an EPIC encounter with Infused. The game was so intense in the final that even as an RTS gamer (okay, so I have history with Counter-Strike…) I was completely glued to the action, and the crowd were incredibly enthusiastic and cheering many of the ridiculously awesome plays we saw out of both teams. I was not forgetting the incredible Starcraft II games that were now progressing steadily through both halves of the winners brackets, though! After watching the epic conclusion to the Halo: Reach final I dashed back to watch incredible emotional scenes as the brackets slowly progressed. (Spoiler Alert – This paragraph only) One of the upsets occured early on in the winner’s bracket where 4k.DreAm, who told me via interview earlier in the day that the player he fears the most by far in the tournament was Dignitas.Tan, manages to overcome his anxiety and pull out a 2-1 win, relegating TanDongHo (the clear favourite of the tournament by ladder ranking, top-10 GM in Korea means an awful lot!) 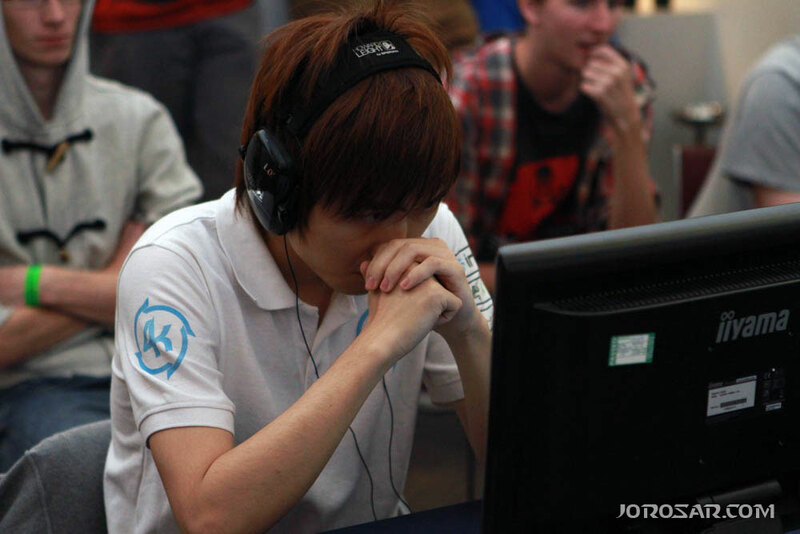 to the lower bracket where he would go out in a shock loss against team Infused’s Lau later on. In the breaks while some of the preliminary lower bracket rounds were being cast by the wonderful team of Leon and Adrenal (who did a phenomenal job by the way, and were there throughout the entire tournament including during the downtime on Saturday! ), some good humour shenanigan-ry was also on the cards. Tan…your build orders are MINE! Though we were all having a lot of fun and things were running smoothly, a lot of constructive work was obviously getting done. 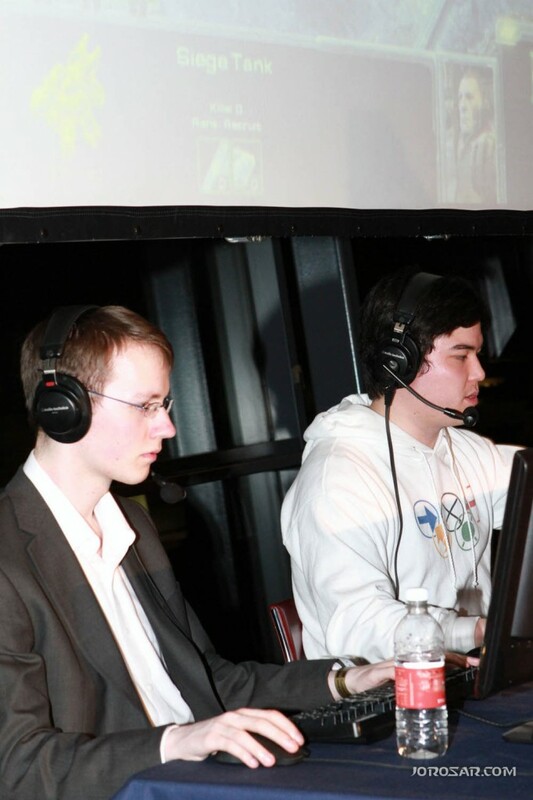 The casters were doing their thing, the admins were ensuring the player-flow at the computers was optimal and I was running around like a headless chicken with my camera. That is, until I unexpectedly heard the most exciting phrase I’ve ever heard from anyone at an eSports event, ever. As things transpired, LeonStarcraft’s voice needed to take a small break due to the accelerated day of cast after cast attempting to run the event back up on schedule. As the other caster at the venue (albeit as a visitor originally!) 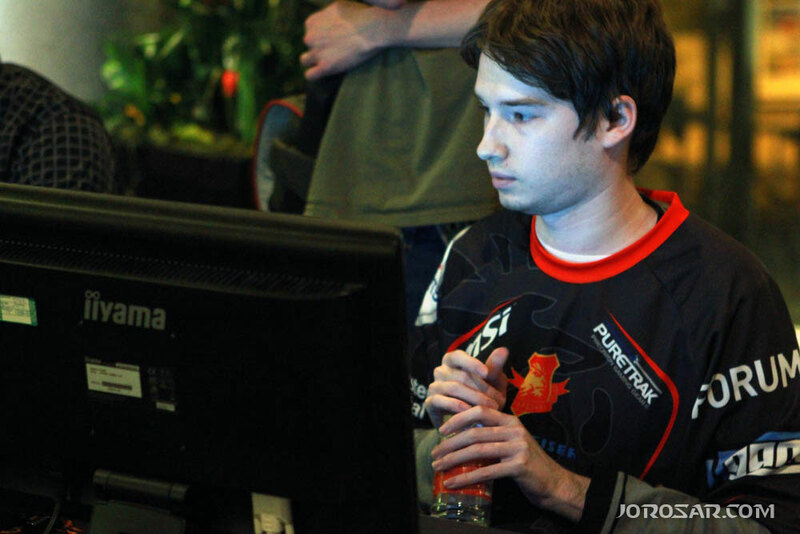 I was called up to cast alongside Adrenal for the remaining lower bracket games – with Leon coming back to cast the Grand Finals. I was ecstatic and want to thank both of the scheduled casters and EGL4 for giving me the opportunity – I only hope I did the community proud. I’m incredibly happy that the initial feedback I received from the community and those on London Barcraft’s facebook page (who unexpectedly saw me on stream and collectively went “Wut! ?”) was very positive. As an added bonus, I was observing on C.H.L.O.E. in what would be her last hurrah as my gaming PC – a fitting tribute! I am sad to report, however, that this is where the tournament encountered its final hurdle that it sadly could not pass. If you recall at the beginning of this blog post I mentioned that one of the problems with the hall on the Friday night was that set up could only be done until 22.00. This was also the case on the Sunday of the event where we would be forcibly evicted at 22.00. 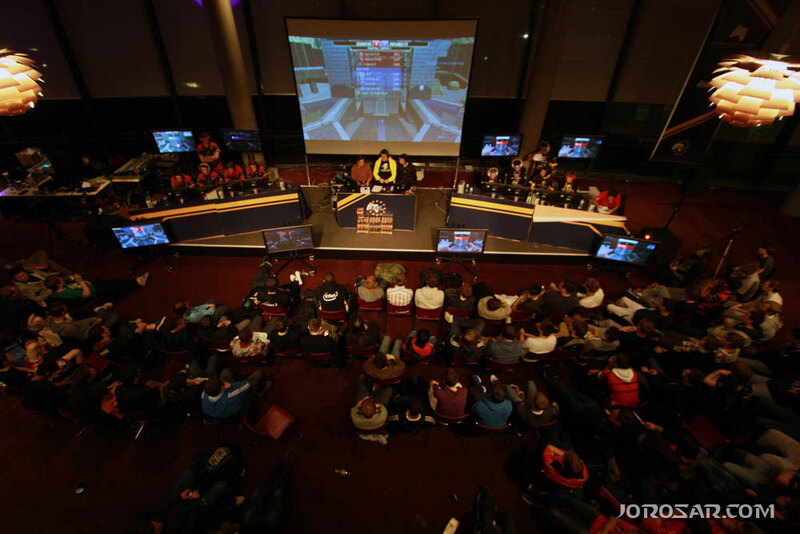 These were not EGL’s rules but those of the venue at the Emirates stadium and to be fair, what was outlined in the agreement to rent the venue. This meant that the stream had to be put off-air so that the stage could be dismantled, and thus the viewership lost out on watching the Lower Bracket Finals and Grand Final. 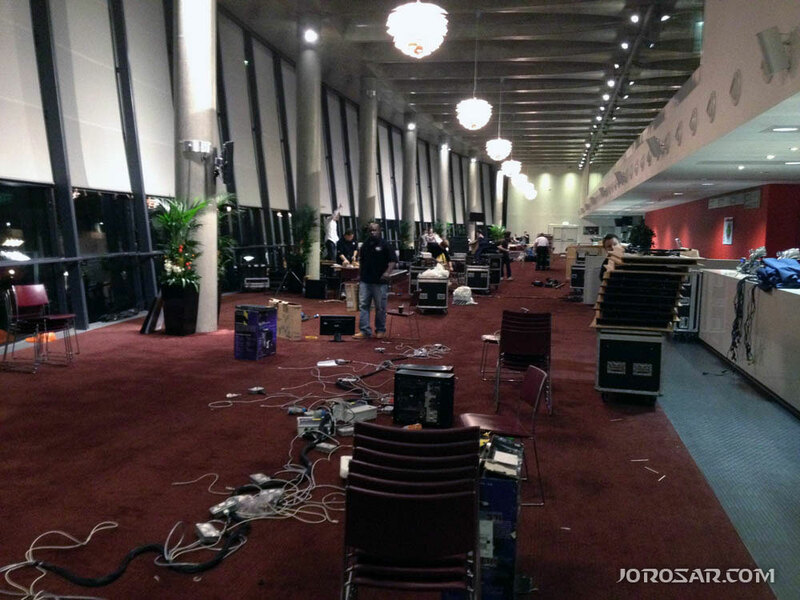 Not only this, but power and network connectivity was removed to the hall, meaning that we had no way of communicating to the outside world or updating the brackets (I tried to keep updates going via Twitter for a while but in case the games got cast later I gave no spoilers. I also posted a bit on the TeamLiquid thread). When they said “We need to pack up” they weren’t kidding – this was the original SC2 room just 30 minutes after the stream went offline. Thinking on their feet, the admins made their final hero decision of the evening and quickly dragged two computers to another event hall where we could try and hang out until midnight, and no later. In a room full of monitors and XBoxes, two lone PCs kept going as the Lower Bracket Finals were played to their conclusion, and the Grand Finals began at 23.15. If you don’t want to know who won the Lower Bracket final or who is participating in the Grand Final, do NOT study the preceeding image, by the way. For those of you with sufficient nerd-knowledge to recognise both players participating in the above photograph immediately, my apologies but you were previously warned. This is where unfortunate circumstance comes in for its final call of the evening, sadly. In large part due to the lack of computers on the Sunday still (remember, 10 working is still less than the 16 originally hoped for), and also due to some incredibly long games earlier on in the Lower Bracket including an hour-long epic, at midnight the Grand Final had to be halted after five games had been played out of a possible seven (the score was 3-2, which isn’t giving anything away seeing as it’s the only score possible with five games played). 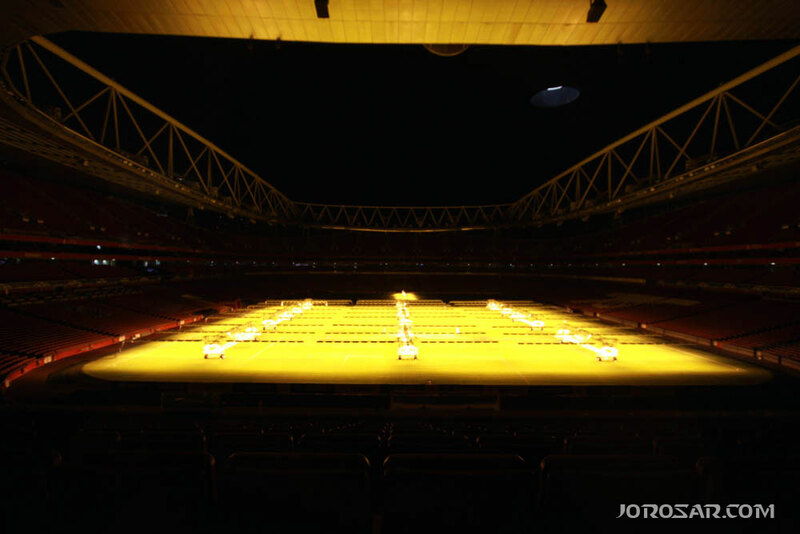 Many of the venue staff had worked a 17-hour shift (not the EGL guys, the Arsenal stadium staff) on the Sunday and we were soberly informed by the duty manager that we would simply be breaking UK law by continuing to use the venue beyond midnight. It was with a heavy heart that we decided the remaining games of the final would be played online in a few days once the two finalists have had a chance to rest. There was zero choice but to apologise to the players and pack away as quickly as possible. The mood was obviously sad and especially so for the finalists who were understandably frustrated, but we huddled together and all agreed (players as well as the EGL staff; there were probably about 15 of us left) that given how ridiculously far behind we were on Saturday and were at one point considering cancelling the tournament altogether, we had done a tremendous job to get this far. It’s unfortunate that another half an hour would probably have concluded the tournament entirely but there was simply nothing we could do to prolong our stay at the venue as once again power was switched off to the ‘backup’ hall where we were trying to blitz out the final games of the evening. 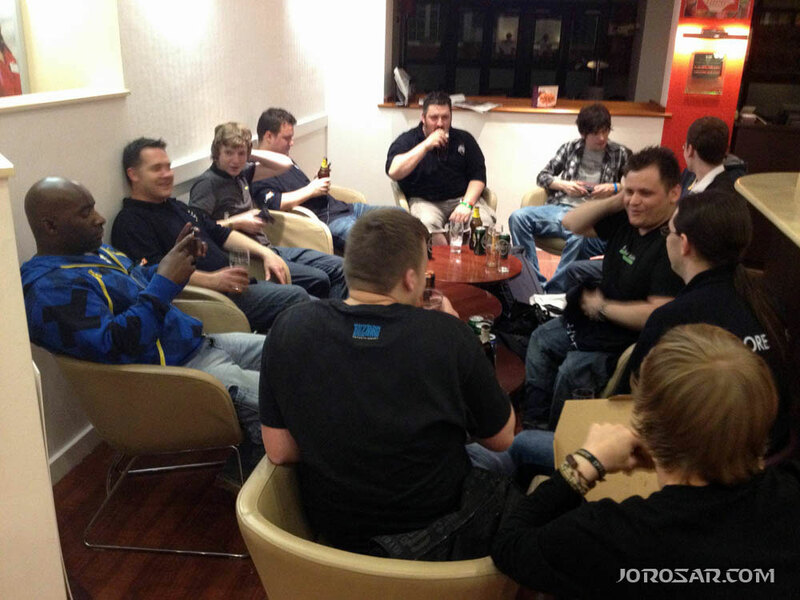 Given that there was nothing else we could do, the EGL crew, casters and players went back to the hotel in a minibus to reflect over pizza and drinks in the hotel lobby. A lovely scene at the hotel was where the third placed player in the tournament (no spoilers for those who don’t want it; those that know who the finalists were can work it out) was presented with his giant cheque by Nick Baker. Afterwards, more reflecting and relaxing (which was sorely required after such a stressful weekend) was the order of the evening. Some of the heroes of EGL who, despite all the event’s problems, stuck around until the very last seconds to try and get the tournament finished. At this point I would like to point out that on the whole, the EPL4 Starcraft event was a success. We had some ridiculously epic games and a very tight bracket that made for incredibly close competition, as well as a tremendous team behind the scenes on top of Adrenal and Leon who raced through Sunday to power through as many games as possible. The players themselves were supremely patient with the organisers as they jumped what seemed like a million hurdles and the staff hauled arse to ensure as many games as possible were played. Of course, it must be acknowledged that failures did occur and need to be improved on for the next event. It’s unfortunate that most of the problems stemmed from a basic lack of computers (ignoring the quality problems of having them built at speed in a competition and then left unchecked) but these issues can be fixed, especially if an agreement with a venue is reached for EGL5 where the admins are given a bit more time to initially set up beforehand. The players had to wait a long time between games and as we know the tournament was not even fully finished on the night (but came oh so close). Personally, I believe it’s of paramount importance to note that every single person involved in the event gave a 110% effort to trying to make it more successful, and it was truly unfortunate that not all the problems could be overcome by the end of play on Sunday. But no – all possible stops were pulled in a gargantuan effort to get as much done as possible. 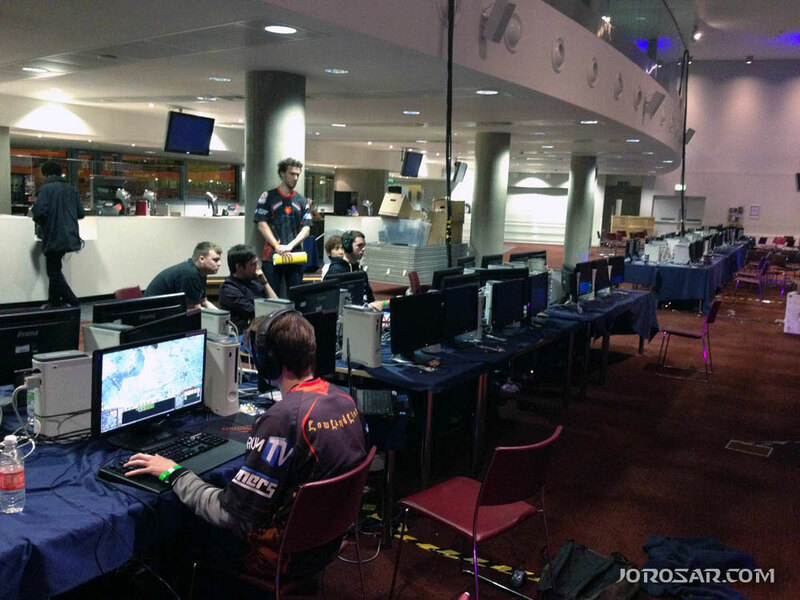 The EGL team, organisers, referees and casters deserve nothing but our highest praise. The vast majority of the problems encountered by them on the weekend were not their fault – but still they fought through and ended up giving the participants the best experience they could muster. As far as I am concerned, despite all the problems I can’t wait for the next one if the same passionate, hard working and enthusiastic people are involved. Finally, the real reason for no result spoilers – thanks to C.H.L.O.E. being used as an observing computer and also a quiet word to the players before the ‘missed’ games (LB Final and Grand Final), I am actually in personal possession of all the replays that were played at EGL4 over the weekend (although I need to plug in and extract them from the depths of the computer). I intend on creating a replay pack (but won’t release it without EGL’s consent) and to try and make a little something up to the non-attending community, I hope that I can arrange for the games that weren’t cast live on air to be re-cast at some point within the next week. These may also possibly include the final one/two games that weren’t played at the venue on the night. I do ask that you bear with us on this, and I promise to update this blog post when I find out if the games are being cast, and if so also with a date and time. Thank you all for making the weekend what it was – things didn’t go flawlessly by a long way, but the people involved and the concentration of passion in the SC2 hall were second to none and I can only hope that all events have people like this involved in the future. UPDATE: I have been informed that the Lower Bracket Final *and* every game from the Grand Final (including all outstanding games) will be cast at some point after i44. This may be a few weeks, so don’t hold your breath (It depends on EGL’s schedule and many of the staff are doing i44 so that’s why it could take a while) – but they WILL BE CAST! For the same reason I’m holding off doing any casting of EGL4 replays until after the official Lower Bracket Final and Grand Final casts are over.